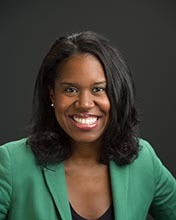 Quinetta Roberson, PhD, is the Fred J. Springer Endowed Chair of Business Leadership at Villanova University. Having earned a doctorate in Organizational Behavior from the University of Maryland, Dr. Roberson has over 15 years of experience teaching courses and workshops globally on leadership, talent management, and diversity. She has published over 20 articles and book chapters, and edited a Handbook of Diversity in the Workplace published by Oxford Press in 2013. Her research interests center on developing organizational capability and enhancing effectiveness through the strategic management of people, particularly diverse work teams. Her research and work with organizations is informed by her background in finance, having worked as a financial analyst and small business development consultant prior to obtaining her doctorate. Dr. Roberson has also served as an expert witness in employment discrimination lawsuits and provides professional advice for several for-profit and non-profit organizations.